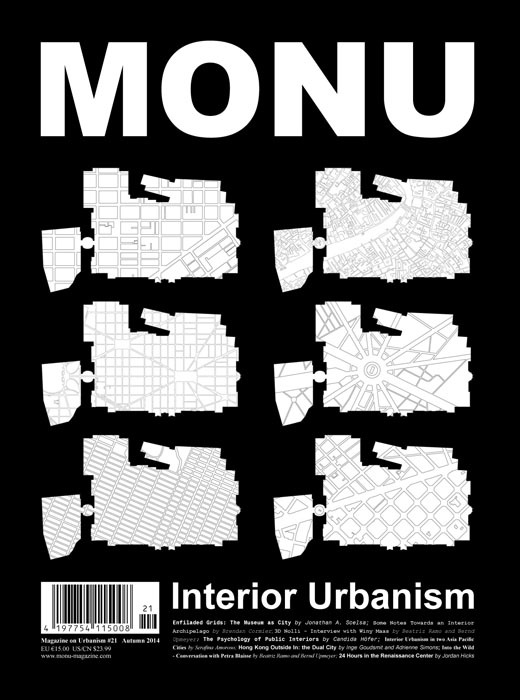 According to Jonathan A. Scelsa this becomes evident in contemporary designs of museums as he argues in his contribution to this new issue of MONU on the topic of “Interior Urbanism“, that deals with the urban scale and urban aspects of interiors and especially of public interiors. In his piece “Enfiladed Grids: The Museum as City” he shows how museums today are being conceived more and more as interior cities within cities. Museum architecture, for example, is informed and driven by urban grids. For Brendan Cormierurban life is an interior affair anyway as we spend ninety percent of our lives indoors. Thus, the city is a massive aggregation of interior environments; our homes, our workplaces, the restaurants and bars that we socialize in, our daycare services and schools, or our doctor’s office. In his article entitled “Some Notes Towards an Interior Archipelago” he imagines a city life that is composed of a series of different and highly individuated interior islands. Individualization and especially personalization play an important role as well for Winy Maas when it comes to interior spaces, as he explains in an interview with us entitled “3D Nolli”, where he stresses the necessity and importance of generosity, to express yourself, and to be able to influence, shape, and personalize your environment to ultimately feel welcome and at home in interiors. In reference to his “Book Mountain” project he argues that to his mind public libraries are one of the last remaining real public buildings of our generation. Candida Höfer in her contribution “The Psychology of Public Interiors” illustrates the rich and varied interiors of libraries. Winy Maas introduces the Nolli map into the discussion on urban interiors as a tool to analyze to what extent public interiors are becoming gradually more urban, although he acknowledges its limits as it is only two-dimensional and do not tell anything about heights and facades, for example. As a sort of updated and reloaded hyper-version of Nolli’s map, Serafina Amoroso – in her article “Interior Urbanism in two Asia Pacific Cities: Spatial Intensifications in Hong Kong and Hanoi” – portrays the city of Hong Kong. Urban spaces, regardless of the public or private nature of their stakeholders, form a continuum of collectively used spaces that link urban routes and new interiors of social life with a particular atmospheric presence, energizing and activating them. But for Inge Goudsmit and Adrienne Simons the atmosphere of Hong Kong’s indoor spaces is by far too orchestrated, too private, and too controlled, supporting social segregation and creating an uncomfortable grey area between public and private spaces, in which no room for spontaneity or chance encounters remains, as they point it out in their piece “Hong Kong Outside In: the Dual City”. For Petra Blaisse too, with whom we held a conversation entitled “Into the Wild”, public interior spaces can easily become too regulated to provide room for chance, surprise, improvisation, and a certain kind of wilderness. However, she thinks it is possible that such “wilderness” may be combined with very well-controlled and well-ordered organizations. Under such conditions public interior spaces can act as dramatizations of urban spaces – able to celebrate the collective psychological pleasures of cities as Jordan Hicks explains in his contribution “24 Hours in the Renaissance Center”. He further states that even though you might not see a protest or a complete and proportional depiction of one city’s demographics, places such as Detroit’s Renaissance Center are hardly elitist pleasure palaces; a city’s urbanism is often more visible indoors than on any street downtown.